Launched in the US about a month ago, the unusual-looking HTC RE camera is one of this year’s most curious products: it’s (obviously) a camera, but it doesn’t offer a viewfinder, instead letting you quickly and easily shoot photos and videos with just the press of a button. At the moment, the RE camera costs $199, and we’ve yet to find out if sales are going well or not. Regardless of that, HTC is already planning a second generation of the device. According to Focus Taiwan, HTC North Asia president Jack Tong confirmed that a new RE camera would be released sometime next year as a product for “the mass consumer market.” While there are no details on the features and design of the upcoming HTC RE camera, we guess it will still be water-resistant, looking not too different from the original model. 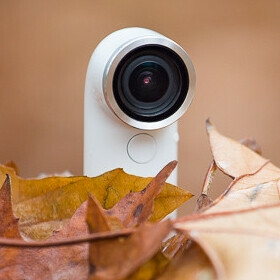 When we reviewed the HTC RE camera (pictured below), we found it quite user-friendly, at the same time noting that the device has some minuses that potential buyers need to take into consideration. Well, maybe the second-generation model will impress us more. IT's OK if they don't release this. expensive and ugly. Better buy a GoPro. What would be EXTREMELY GREAT!, would to be able to have OIS as well as Auto Focus from Macro to Regular Pictures and Video. Have it for Manual Control from the App. Also, see about Cross License with LYTRO for their Tech for the Re 2.0 Then for the Accessories. Have Mounts that when Screwed in, they have a Notch where the Power can be Plugged in for Any Extended Use like Time Lapse or Long Videos longer than what the battery is rated to last. And Lastly. Make STANDARD a Lens Cap that Comes WITH the Purchase of ALL RE Models.